This week’s giveaway is the new and updated edition of one of my all time favourite fertility books, It Starts With The Egg by Rebecca Fett - a practical and evidence-backed approach for improving egg quality and fertility. This week Ben & Anna are giving away his and hers natural soda deodorants to 5 lucky couples. With 7 scents to choose from, the winners will receive a natural deodorant for themselves and their partners to enjoy. And they are certified natural and certified vegan as well as coming in completely plastic free packaging as an extra thumbs up to the environment! This week’s giveaway is a Madeleine Shaw cookbook trilogy, helping the winner to improve their fertility through some good old fashioned home cooking of super-duper healthy recipes. This week leading fertility specialist Emma Cannon is gifting two of her books on fertility to one lucky winner. The books Fertile and You and Your Bump are both up for grabs in this Friday’s giveaway. This week Bud are giving away a 3 month supply of male and female natural pre-conception supplements, along with the 24 page fertility guide. This week’s giveaway is My IVF Journey, a beautifully presented IVF diary created by Nothing But Lovely in which to record your IVF experience. Coombe Farm Organic, an award winning organic farm in Somerset which prides itself on its ethically raised and humanely slaughtered, exceptional quality livestock, is giving away one of its fabulous Introduction to Broth Boxes. Jizo & Chibi, an online shop selling beautiful buddhist jewellery, is giving away a large gold Chibi fertility necklace. 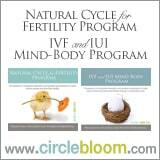 To help them to achieve their health and fertility goals by harnessing the power of the mind/body connection. Meditation and visualisation—picturing situations—are powerful tools you can engage to de-stress and take control of your life. Circle + Bloom are passionate about the potential of the mind-body connection. Women have successfully used their programs to increase fertility, get pregnant and improve their general health. You don’t need any equipment, supplements, or medication to start their guided meditation programs, which are under 25 minutes (many are around 15 minutes). Listen to them daily or when you need them to achieve your desired health goals and influence your specific circumstances. De-stress and prepare your body for pregnancy with this free guided meditation for fertility. Have you recently miscarried? It can be a traumatic and isolating experience. This free guided meditation can help you work through your grief and look forward to the future.